The Physiology of Nerves series displays the basic structures of the human nervous system. Each of the five sections of the nerve model shows a plastic colored relief model of the main synapse variations. 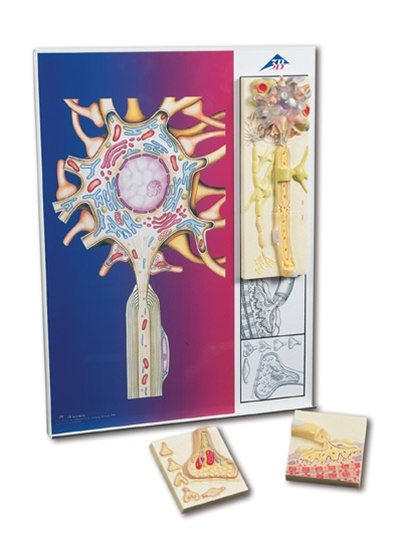 All sections of the nerve physiology series can magnetically attach to the illustrated base which depicts the neural components in vivid colors. Each nerve section is also available separately. 4. Motor End Plate Neuromuscular junction with striated muscle fibre is depicted. 5. Synapse Featuring the endoplasmic reticulum, mitochondria and the membranes of the synaptic gap.